Removing painted wallpaper from plaster wall. Is your house covered with stubborn, old painted wallpaper standing between you and your dream home? The removal of wallpaper can be a daunting task on its own, but removing painted wallpaper is an even more difficult task. Major physical labor is involved, but there are steps you can use to make it a do-it-yourself project that doesn’t give you too much grief. 1) Make sure the paint doesn’t contain lead. In many older homes, the paint contains lead. If it does, you must use all the precautions recommended for removing lead-based paint. 2) See if the wallpaper is strippable. Newer wallpaper is often strippable, but make sure you check to see what’s underneath. 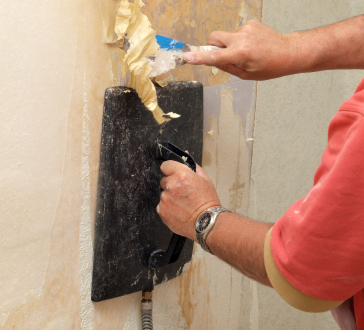 If it is drywall or plaster, stripping can cause damage to drywall. Strippable wallpaper is designed with a vinyl or decorative paper layer that pulls away from the base layer. If you pry up the corner of the paper, it will tear away from the backing layer that is glued to the wall. First and foremost, you are going to want to protect the area you are working on. Get an old sheet or plastic covering and lay in on the floor to catch the painted wallpaper that has been scrapped off. If you are using a chemical stripper, you will also need to lay towels down to absorb the dripping solution. 3) Help the wallpaper remover penetrate the paint film. Next, you will want to penetrate the paint film by using a stiff wire brush to wear down the surface. Another great option is to use a tool called the Paper Tiger. 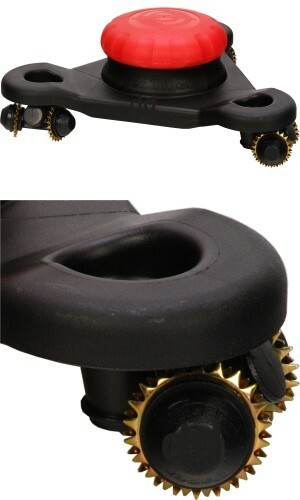 This tool has multiple small pins attached to wheels. It’s a small, round plastic tool and is easy to grip and hold. The Paper Tiger works by making small holes as it rolls over the painted wallpaper surface. The Paper Tiger can score an entire room in few minutes, does not damage walls, eliminates the need for a steamer and will not rust or wear out. 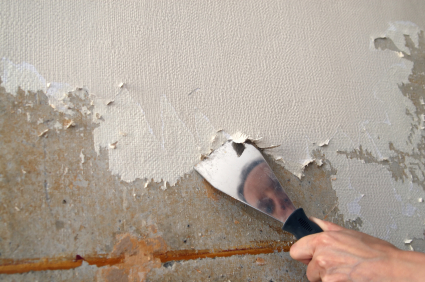 Apply wallpaper remover to all walls by using a sponge or paint roller. You will need to keep applying as it dries out and slowly soaks into the small pin holes left behind by the scoring tool. Allow the remover to soak into the wallpaper for 15-20 minutes before trying to remove any wallpaper. See Make Your Own Wallpaper Stripper for more details. 4) Try using a wallpaper steamer. If scoring the wallpaper and remover doesn’t work, you can use a wallpaper steamer. 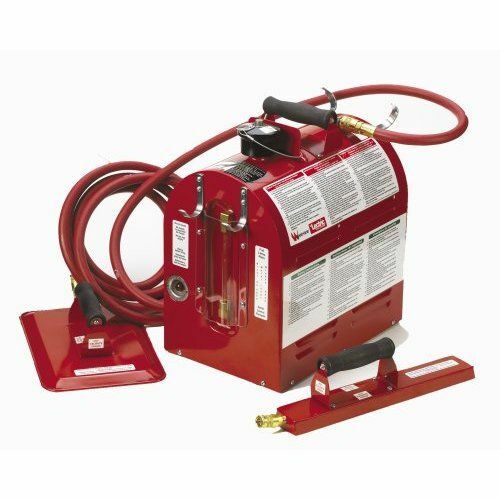 A wallpaper steamer is a hotplate with a hose attached that uses a hot water reservoir to heat the water and direct steam to the hotplate. You will want to have a baking pan nearby to put the hotplate in when it is not in use. Always start at the top of the wall, holding the hotplate against the surface to soften the wallpaper glue. See Using a Wallpaper Steamer for more details. 5) Apply chemical paint stripper if necessary. As a last resort you could use a water-based chemical paint stripper to remove the painted surface. Remember, most chemical strippers are toxic and could cause serious damage. Wearing a mask and clothing that covers your skin is important. Mix the chemical stripper with hot water and then spray the solution on the painted surface. You may also apply the mixture with a paint roller. Most importantly, you will only want to spray about a three-foot floor to ceiling section at a time. The solution will dissolve the paint. It will probably help lift the paper from the surface as well. 6) If it won’t come off – Cover It! 99.9% of the time scoring, wallpaper remover and elbow grease will prevail when removing painted wallpaper. But there are two options that might be better for your situation. Hang heavy, textured, paintable wallpaper over your old wallpaper. Paintable wallpapers are available with many different textures including standard types like orange peel and stomp. If your current painted wallpaper is so well adhered that it won’t come off this might be a good alternative. Laminate 1/4 inch sheetrock over your walls. This mainly applies to very old homes where the wallpaper is holding the plaster together, without it everything falls apart. I recommend a drywaller or other pro do this type of work. 7) Tips for removing painted wallpaper. Use a sharp stiff 3 inch putty knife or wallpaper stripping knife. Normally I don’t recommend using sharp tools for removing wallpaper but getting the painted layer off will be tough. The extra sharpness will help. It is most likely the wallpaper will come off is small pieces. Keep wetting the worked over areas to help loosen additional areas and layers. Using a spray bottle with wallpaper remover helps to keep everything wet. A sponge or paint roller can also be used. Gelled wallpaper remover won’t work as well as it doesn’t penetrate easily. Use thinner wallpaper removers. Removing painted wallpaper will definitely be a tedious, time consuming and a physically laborious job, but once you are done, you will feel accomplished and love your completed project.